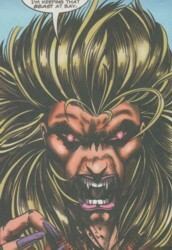 (Blade: Vampire Hunter I#6 (fb) ) - Originally the Bloodshadows were led by a guy named Cutter. (Blade III#4 (fb)) - After Blade arrived in NYC he immediately sought out a club Madame Vanity told him about. He was brought inside when he told the bouncer the code for members of the Order of Tyrana. He was brought to Cyrus Cutter and joined his gang the Bloodshadows, but what he saw in the following months led to a fight between him and Cutter in which he stabbed Cutter to death. (Blade: Vampire Hunter I#6 (fb) ) - Blade took over the gang after Cutter's demise. (Blade III#5 (fb) ) - One day Hector came beaten up to Blade and told him that a guy wearing a cowboy hat and black raincoat did this to him. Hector was sure that this guy was a vampire, and Blade decided to go after the vampire, but the vampire he found wasn't wearing a cowboy hat and raincoat. It was still too strong for Blade, who soon got some help from the mysterious guy with the cowboy hat. It was Logan (the future Wolverine), who killed the vampire with Blade's stake and then helped Blade, who was badly beaten up. (Blade III#7 (fb) ) - Blade took the Bloodshadows to London, where they hunted vampires, demons and warlocks for months. (Blade: Vampire Hunter I#6 (fb) ) - One night they went to an old woman's house on Blaylock Street. Glory was sure that they would find money and precious things because normally old people didn't trust banks. After breaking into the house they soon found a room filled with bleeding humans and the vampire Lamia. Carla stabbed Lamia and was ripped apart. Hector and Chen attacked her with their knives as well, but they too became victims of Lamia. Blade tried to protect Glory from the vampire who realized that he was tainted since birth. Glory helped Blade when he was overpowered by Lamia and saved his life. Lamia tossed Blade to the outside and seemingly killed Glory. Blade returned home with broken bones. Later that night Glory returned to him as a vampire. Comments: Created by Ian Edginton (writer), Nick Napolitano (pencils), Steve Moncuse & Phil Moy (inks). The prostitute Blade saw at the beginning of the same issue wasn't confirmed as Glory. Blade knew that it couldn't have been her because Glory was a vampire and they were all destroyed by the Montesi Formula when Dr. Strange used it in Dr. Strange II#62, but many vampires returned since then. Why shouldn't she have returned as well? In OHotMU Marvel Knights 2005 Blade: Vampire Hunter I#6 was placed some time before Blade had to kill his mentor Jamal Afari. Due to the events in Guggenheim's Blade title we now know that his time with the Bloodshadows took place in the 1930s. Unfortunately the Bloodshadows' demise now has to be placed after Afari's death because Glory was seen with Blade shortly before he killed Afari. In Blade III#12 a prophecy was fulfilled that brought back all vampires that ever died. This most likely included Glory as well. We'll have to wait if she resurfaces. It would be interesting to see her meet Blade again. (Blade: Vampire Hunter I#6 (fb) - BTS) - At some point Glory became his girlfriend. (Blade III#4 (fb) ) - Cutter was the leader of the New Yorker gang Bloodshadows and had connections to an organization named the Order of Tyrana. One night Blade came to him and joined his gang. The following months Blade saw a lot of things he didn't like. In the end Cutter and Blade had a knife fight and Cutter was stabbed to death by Blade. (Blade: Vampire Hunter I#6 (fb) - BTS) - Years ago Glory became a member of the Bloodshadows and the girlfriend of their leader Cutter. (Blade III#4 (fb) ) - She was Cutter's girlfriend and met Blade for the first time when he wanted to join the Bloodshadows. One Christmas she was beaten up by Cutter which was seen by Blade. Glory couldn't run away because Cutter would find her anywhere with his connection to the Order. After Blade had killed Cutter she told him that there was nothing else he could do because Cutter would have killed him and her. (Blade: Vampire Hunter I#6 (fb) ) - When Blade took over the Bloodshadows she became his girlfriend. (Blade III#5 (fb) ) - Glory told Blade about the rumors of a vampire working the row after Hector told them that he was beaten up by someone he thought was a vampire. (Blade III#7 (fb) ) - Blade went with Glory and the other Bloodshadows to London. At first she was concerned if the Bloodshadows would believe in vampires, but they believed Blade and joined him in killing them. (Blade III#10 (fb) ) - Blade went with Glory to his mentor Jamal Afari, who wasn't at home. Blade broke into Afari's home and got concerned when he saw that Afari wasn't at home for days. (Blade: Vampire Hunter I#6 (fb) ) - At their raid at the house on Blaylock Street she was turned into a vampire by Lamia. She returned to Blade and revealed her new nature to him. She didn't kill him because he was always kind and respectful to her and never hit her like her boyfriends before. She warned him to never come looking for her or else she would kill him. They never met again. (Blade: Vampire Hunter I#6 - BTS) - Blade saw a prostitute that looked like Glory. He tried to follow her to find out if it was really her, but couldn't when she left with a customer in a car. After thinking about the past Blade realized that Glory was probably destroyed alongside all other vampires by the Montesi Formula. (Blade III#5 (fb) - BTS) - One night Hector tried to lift the wallet from a guy with a cowboy hat and black raincoat (Wolverine), but Logan caught Hector and beat him up. Hector surprised Logan by stabbing him in the chest and then cutting his throat. Logan went down and Hector went looking for what he could take, but Logan wasn't dead and Hector had to cut him again to get away alive. (Blade III#5 (fb) ) - Hector went to his boss Blade and told him about the incident and his assumption that the guy with the cowboy hat was a vampire. (Blade III#7 (fb) - BTS) - Hector went with Blade to London, where the Bloodshadows killed vampires and other occult evils at Blade's side for months. (Blade: Vampire Hunter I#6 (fb) ) - One night they raided a house on Blaylock Street and Hector was killed by Lamia.